Based on the information and discussions from the ACTFL-CEFR Conferences and resulting papers and journals, ACTFL worked with an EU-based research group to develop an ACTFL-CEFR crosswalk to be able to offer CEFR ratings for ACTFL assessments. The findings from the extensive research and linking and validation studies, show that CEFR ratings can be assigned on ACTFL assessments, in all languages. Studies also indicate that these are one-directional correspondences, that is to say, CEFR ratings can be assigned to ACTFL tests, however, the reverse cannot be stated. To date, no CEFR-based test, or other international test not developed by ACTFL, has been linked to the ACTFL Framework. 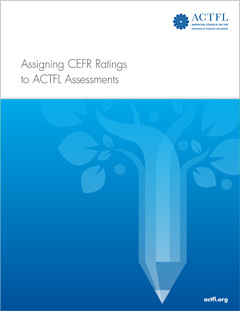 Download the complete text of the Assigning CEFR Ratings to ACTFL Assessments document (PDF).